If you've never been to the sea, the Fisheries Museum of the Atlantic is the place to start your ocean experience. If you have been to sea, this is definitely the place to reacquaint yourself! The Fisheries Museum of the Atlantic commemorates the fishing heritage of the Atlantic coast of Canada and has recently been named as one of the top 1000 best places to see in the US and Canada before you die. Housed in brightly painted red buildings, with floating vessels at wharfside, the Museum offers a host of attractions, a maritime gift shop and restaurant. 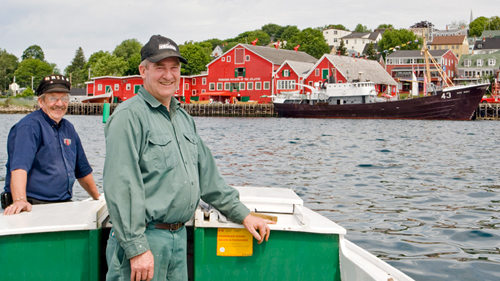 Retired fishermen and experienced Heritage Interpreters accentuate the experience of visiting the Museum. Entertaining activities and demonstrations take place daily throughout the full season from mid-May to mid-October. The Fisheries Museum of the Atlantic is operated by the volunteer Board of Directors of the Lunenburg Marine Museum Society, for the Nova Scotia Museum. Bluenose II, Nova Scotia’s sailing ambassador, is also operated by the Lunenburg Marine Museum Society.